International Day of Zero Tolerance of Female Genital Mutilation. 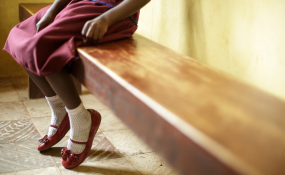 Female genital mutilation (FGM) is one of the serious health problems facing African countries. While some countries have banned the practice, meting out punishment to offenders, others have yet to follow this path. Sadly, the practice continues even in countries where it has been banned. FGM involves procedures that intentionally alter or cause injury to the female genital organs for non-medical reasons. The procedure has no health benefits for girls and women - on the contrary, it can cause severe bleeding, problems urinating and, eventually, cysts, infections, complications during childbirth and an increased risk of stillbirth. According to WHO, more than 200 million girls and women alive today have been cut in 30 countries in Africa, the Middle East and Asia. In this interview with This is Africa, Ekene Odigwe, a journalist in Nigeria who is passionate about using every tool in the media ecosystem to produce and support anti-FGM campaigns, discusses Bleeding Flower, a movie he co-produced with friends to create awareness, help end FGM in Nigeria and elsewhere and encourage victims to speak up. Ekene Odigwe: We shot it at the Young African Leaders Initiative Programme in Nigeria. It was a fellowship programme, during which we considered the problematic issues in Africa. One that kept coming up was FGM. Actually, one of our participants was cut. She was walking in a funny way, which we didn't understand at first. Then she explained that she had been cut and suffered seriously debilitating period pain. She sometimes struggled to walk and everything scared her. Her story really resonated and we started doing research. We found that South East Nigeria, for example, had a lot of issues surrounding FGM but people didn't talk about it. They felt that if you did, you were fighting culture, which was something that was meant to be preserved. So people did it beneath the table. This secrecy means that many lives are lost and women's rights violated. If you meet someone who has been mutilated, you will find out that they are emotionally and physically damaged because at every point in their life, it keeps coming back. So I asked, what can we do? I am using the tools that media provide, but we can't just keep writing and pushing; there is something more we must do. We built a team that came up with a script and we did a film. There 145 of us on the fellowship, returning to nine different countries. We decided that we wanted to go back with something that would bring people face to face with the issue. People love entertainment, so we decided to put the issue onto the screen. Since I've been back, all I have been doing is touring towns, showing this movie and holding sessions and talks on how we can end this. And believe me, it has worked. A lot of people who have been cut are speaking out. The Enugu State government is again looking into VAPP - the Violence Against Persons Prohibition Act. At some point they stopped, then we called them out and now they are back on it. What that will help us achieve is that people who are violated could then sue. People, especially women, who feel their rights have been violated can see that there is something to fall back on in terms of legal backing. In President Goodluck Jonathan's era we had the Bill, but most states have yet to domesticate this Bill. If they domesticate it, the states can own it. We don't want this legislation to be on paper; we want it to be real. And when people own it and feel it, we can safeguard them against a whole lot of things. That's the reason that I am passionate about the fight against FGM and showing Bleeding Flower, because it will help us come out from where we are to where we want to be. TIA: Bleeding Flower is mainly being shown in urban areas and, as you know, FGM is done mainly in the rural areas. How do you intend to reach out to the rural areas because that is where the practice is rampant? EO: I would say that was why we did the movie. It was done primarily for the rural areas. As I said, we were 145 fellows from nine different countries. The idea was that when we got back to our countries, you would move from town to town and from village to village to show them this movie. We did what we could for the moment because of the constraints imposed by the various locations and other logistical issues. We shot the movie with an iPhone over five days, so you can imagine what it was like. We did what we did because we are passionate about the issue and wanted to pass on this message. People adore their local celebrities, so the intention from the start was that when you get back to your village, the villagers, the cutters and everyone else, will see some of those celebrities in the movie. For example, the lady who was circumcised is a popular lead actor in The Gambia. So imagine the impact when you go home and you are bringing this film to them, showing them the nitty-gritty of how it's done, why they should join you in the fight and why we should all be advocates in the fight against FGM. TIA: How has the film been received by members of the public? EO: We have shown this movie in four locations. One was at the Centre for Memories in Enugu. The idea was that we wanted people from Garki Awkunanaw to come around and see the movie. And they did. The first time we had a smaller crowd, but the second time the number increased. The third viewing was at the School Board venue, which we did in collaboration with Breast Without Spot, a breast-cancer awareness group. When women gather to talk about cancer in a close, safe niche, it provides a good space to help us sensitise them to the issue of FGM. I believe we must not wait for the government to do this advocacy for us. We are part of government and if we must use advocacy to effect and institute change. You don't even have to pay people or give them anything, because when you are passionate for change, you will push the drive. You can even press the government to key in, because no government wants to be seen as being anti-developmental. Anyone who understands human resource development and technical development also understands developmental issues and will want to buy in. If we give them that chance, saying, this is your green light, come on in, then they will definitely come in. So that is how we are doing it. In addition to those screenings, we have shown the film in other places, like Lagos, Calabar and The Gambia. At the end of every quarter, we look at reports on and reactions to the film. Believe me, people comment after they saw the film because they were not expecting to see how the whole process is carried out. The first reaction often is, "Oh, it's that bad. How can we help?" This is something we have always wanted to achieve - forming alliances. It's not just female fighting for female; we are looking at all of us uniting and fighting for our children and our mothers and daughters. These are our daughters, you know, they are within our circle. So let's give a human angle to the story and help people understand why it is bad. TIA: Can you explain what is meant by the "medicalisation" of FGM? EO: One of the issues that came up when we started this campaign is that cutters use the same instrument that is not washed or cleaned for different persons. They perform it in the same manner as way back then. We are saying, stop this, because you are not just cutting out a part of their bodies but you are also violating their rights. You are causing emotional distress and trauma. You are also infecting them with diseases. Many diseases are transmitted through bodily fluids. But now people believe that since we are now able to fight such diseases, you just sterilise the instrument you use and carry on. You will be shocked by the extent people will go to in the name of preserving culture. So the practice of FGM has moved to the hospitals. Now in the hospital if you give birth to a girl, you will take her to be circumcised. It's a closed circle. You can just talk to the nurse and the nurse can easily do it for you. So now they bring in the mutilation from the villages to public hospitals and they are using public equipment. They tell parents that because it's in the hospital, you are sure your child is safe. But what we are saying is that apart from disease, you are inflicting trauma on these girls. It's inhumane and you can't even imagine the pain people go through. TIA: What do you think is the role of education in creating awareness of the fight against FGM? Most of those who engage in it in the rural areas are not knowledgeable about it. EO: FGM has moved from being a regular rural area practice to towns and cities. There was this situation, for example: A medical doctor and his wife, a lawyer, came back from abroad. The family pressed the lady to get mutilated at the age of 32. And the reason they kept giving her was that she was not pure and might not give birth to a child - not knowing that the lady was three weeks pregnant. Eventually, she agreed because she wanted to maintain her home and let everything be peaceful. But in the end, she lost the baby and her womb and had major complications and the trauma of it all. She lost the child she always wanted. It's crazy. Right now, education remains the major key we can use to unlock issues surrounding FGM. I always say that we cannot talk about FGM without talking about sexually transmitted diseases. Tackling SDGs offers us ways in which we can talk about human rights. Human rights, on the other hand, offers us a guide on how we can use SDGs to work for human rights. So, it is a two-way thing but education is at the centre of it. With education (not necessarily formal education), we can tell people, do pictures, props, letters and videos, which were what informed the video. Advocacy needs education; it is the key that will help us to change everything. And until everyone begins to view the issue of FGM as something personal which they should be part of, we will not be able to change it.